The extraction of espresso from ground coffee is a markedly different process from brewing drip coffee. Espresso is created when hot water is forced through finely ground coffee at very high pressure. What follows is an explanation of the different types of machines available, and how they achieve this. Manual: Manual/Lever espresso machines are the most basic when it comes to espresso extraction. Water is heated inside of the machine's boiler, while the pressure needed to extract the espresso is generated by manual levers that are pulled by operator, which is how the term "pulling a shot" originated. Manual style machines make use of portafilters and require the coffee to be ground and tamped prior to brewing. Lever espresso machines are not for the novice, but are arguably the best method for making espresso. Because there is no pump, there is less to maintain and more variables in making the espresso. If complete control is what you desire a lever espresso machine is for you. I personally have several lever espresso machines and thing the best espresso I've made is with a lever machine. Semi-Automatic: Semi-automatic espresso machines are a bit more sophisticated than manual machines. In addition to possessing a boiler to heat water for espresso extraction, semi-automatic machines generate the 9 bars of pressure via the use of an electric pump. Semi-Automatic machines can feature levers, rocker switches, or push buttons to operate the pump. Like manual espresso machines, semi-automatic machines also make use of portafilters and require the coffee to be ground and tamped prior to brewing. Super-Automatic: Super-automatic espresso machines incorporate more technology in their design than manual or semi-automatic machines and are designed to simplify the user experience. In addition to utilizing boilers and pumps to produce heat and pressure, super-automatic machines also possess internal grinders and tamp coffee through the use of a mechanism known as the brew group, where the grounds are compacted into a puck similar to that in a portafilter. For some people, the tamper is just one of the many tools involved in the preparation of espresso, whereas others view it is an intimate and integral step in the process. As you embark on your journey to personalize and perfect your espresso experience, the type of tamper you use may one day become an important factor in how you prepare your espresso. Over the years a number of variations on tamper designs have emerged, but we'll confine our discussion to two key varieties. Flat tampers, as their name implies, have a flat surface, which you use to compact and level your coffee. Flat tampers provide an even surface for the water to flow through, which some view as being ideal for espresso extraction. Convex tampers are designed with a slightly rounded surface. They are preferred by some, as it is believed that they are better at compacting the coffee on the sides of the filter basket. Because the center of the tamper is slightly deeper than the edges, some believe this causes water to flow better through the center of the puck during extraction. The filter basket can be a traditional double-shot basket or a single-shot basket. Fill the basket with 7 to 10 grams of coffee per shot and apply approximately 30 pounds of pressure to the grounds with your tamper. Factors such as tamp pressure and grind fineness play a much larger role when brewing espresso with the commercial style basket. When using a traditional, commercial style portafilter, tamping your coffee becomes an important variable in the preparation of your espresso. As recommended by the "Golden Rules," a tamp pressure of 30 lbs is desirable when trying to achieve consistent, quality shots. Maintaining a consistent and specific tamping pressure of 30 lbs eliminates an entire variable from the brewing process, allowing your to modify other factors such as grind fineness and observe the differences in the shots you pull. While it is true that the extraction time of your shots is largely determined by your tamping pressure AND the fineness of your grind, grind fineness is more difficult to measure, and as a result, more difficult to duplicate. Additionally, regardless of the fineness of your grind, tamping too lightly or too strongly can still result in shots that are too fast or too slow respectively. So, how do you achieve consistent tamping pressure? Well, the real answer is practice. Like all elements of brewing espresso, tamping is a process that requires a bit of time to master. An easy way to get an idea of what 30 lbs of pressure feels like is to place a towel on a bathroom scale and press down, you'll be able to see just how hard you've been tamping. Alternatively, specially calibrated tampers and tamping mats exist that alert the user when 30 lbs of pressure has been achieved. One of the aspects that defined the coffee produced by Achille Gaggia's patented espresso machine design in 1938 was the thick crema produced by the pressure brewing process. Rich crema has since become a desirable aspect among modern espresso drinkers, but what exactly is crema? In truth, crema is a foam, created by suspended solids and CO2 and is a phenomenon that only occurs in espresso, which was originally dubbed caffÃ¨ crema (cream coffee). Unlike brewing drip coffee, where gravity pulls hot water through ground coffee at regular atmospheric pressure, espresso is ideally brewed at 9 bars of pressure, the key factor which allows for crema to be produced. The high pressure environment inside of the portafilter allows for the water to become supersaturated with CO2. When the water exits the portafilter in the form of espresso, the CO2 forms into thousands of tiny bubbles which are coated by parts of the oil extracted from the coffee, thus becoming the foam the floats on top of your espresso, aka, the crema. Without question, the temperature of your espresso can make or break your experience. Even with perfect preparation, shots that lack temperature stability will cool too quickly, producing an espresso that leaves something to be desired. Conversely, there are circumstances, such as switching from steaming to brewing, where the water you brew with will be too hot. Fortunately, ensuring temperature stability is easier than you might think. Outlined below are several methods you can employ to ensure that your coffee is brewed at the correct temperature and stays at the correct temperature. Preheat Your Portafilter: If you're just turning your machine on, the heat from the boiler may not have had enough time to properly heat your portafilter. Before brewing, it is always a good idea to pull a blank shot to heat up the internals of the machine as well as your portafilter. A blank shot is performed simply by pulling water through the machine as if you were brewing espresso. Additionally, try to keep the portafilter locked into the group head, if you're going to be brewing multiple shots, to prevent heat loss between extractions. Preheat Your Cup: Your espresso cup is the your coffee's final destination and the last opportunity for it to lose a significant amount of heat. By preheating your cup, you help to ensure that the temperature of the coffee does not drop when the brewing process is complete. An easy way to preheat your cups is to fill them with hot water from the steam arm or group head. Alternatively, you can use your machine's cup warmer if it has one, although, this will take longer to heat your cups. The Cooling Flush: In certain circumstances, such as when you use the steam wand to prepare multiple specialty drinks, it is important to make sure that your water isn't too hot to be used to brew espresso. In single boiler machines, like the Gaggia Classic, which has only one boiler that heats water for both brewing and steaming, performing a cooling flush can prevent you from burning your espresso. When you use your machine to produce steam, the water is heated to a much higher temperature than is appropriate for brewing. If you immediately go from steaming milk to brewing espresso, the water in the boiler is likely to be much hotter than it normally would be. A cooling flush involves running water through the steam arm and through the group head after steaming. Not only will you clear out any residual milk from the steam wand this way, but you will also drain the hotter water from the boiler, preventing you from brewing shots that are too hot. Steamed milk is the end result of milk being exposed to high pressured steam from an espresso machine. It is made by introducing steam gradually into milk until the natural fats within it expand to create 'micro-foam', a layer of very small milk bubbles. The end result is a smooth, silkily beverage perfect for espresso based drinks. The idea sounds simple enough, but in practise it requires a gentle touch and sound technique. The first step is filling your jug with milk. This may sound like a obvious step, but it's actually quite important to get the right amount of milk in your jug, not only to produce the best steamed milk but also for milk conservation. Fill the milk 1/3 way up the jug. Chose a jug that when 1/2 full will make enough milk for your drink. The second step is called ‘stretching’ and is when you turn the steam on and have the nozzle of the steam wand near the surface of the milk to make a hissing sound. This processes creates micro-foam by letting air gently into the milk. The key is to have the nozzle just a fraction under the surface of the milk in order to create foam while making the milk spin in a whirlpool motion. I find that the milk stretching stage lasts about 5 seconds as you only need to introduce a little bit of air into the milk. Once you create enough foam for your coffee -- more for a cappuccino less for a latte -- you move onto the third stage. The third stage is called ‘spinning’ and is when you submerge the steam wand nozzle another fraction down the milk -- literally half a centimeter (1/5th of an inch) -- and continue to spin the milk in a whirlpool motion. You should hear no hissing sound, other than the occasional leftover bubble being eaten up by the steam wand. This spinning process mixes the micro foam with the milk in order to 'polish' the milk. The key to spinning the milk is to tilt the jug a little to get the perfect whirlpool. You’ll need to find thesweet-spot which is a little off-centre the jug and try to keep it there from start to finish. Keep spinning the milk until the jug becomes too hot to touch or around 60 degrees celsius (140 fahrenheit) then turn off the steam and wipe your steam want with a wet, clean cloth. However I find for latte art it's best to have the milk a little cooler around 50 degrees celsius (122 fahrenheit). Once the milk is made give the jug one solid THUMP on the counter to disperse any big bubbles and then leave it to sit whilst you put the espresso shots on. Then, before pouring, swirl the milk around the jug to polish the milk and to make sure the milk and micro-foam is together. The more shiny the milk the better, but don’t be too rough otherwise you’ll make new bubbles. You want the milk to look like wet paint. When the milk is well-spun, the foam will pour out of the jug first because it sits near the top. You want to pour the milk into the coffee at a steady pace. 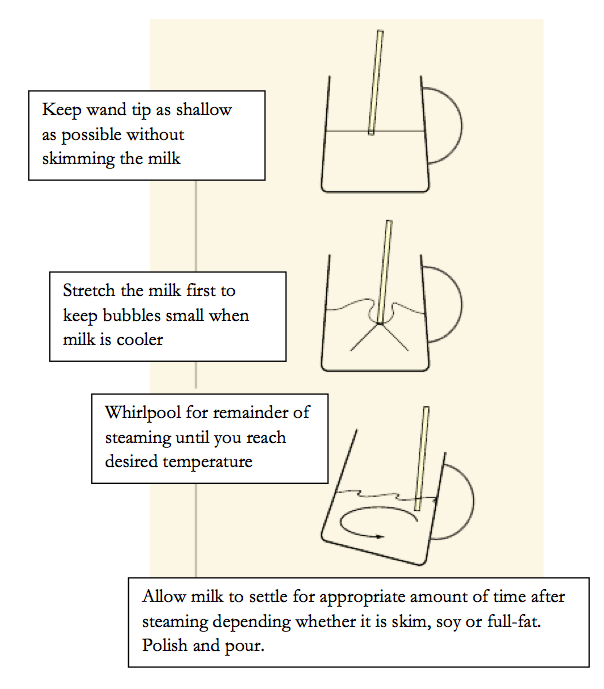 The key is to pour the milk along side your cup by resting the spout of the jug on the top of your cup. If you used a big jug you will want to distribute the foam between the different coffees. The general rule is to pour cappuccinos first, hot chocolates second, lattes third and flat whites last. Another handy tip is to 'spilt' your milk by pouring half of your milk into a smaller jug, this lets you have more control of how much foam you add to your milk-based espresso drinks. Congratulations you've now learned how to steam milk!